LaPorte, IN — Franciscan Health and Beacon Health System have announced plans to build a small acute care hospital equipped with a 24-hour Emergency Department in LaPorte, IN, adding to the I Street campus where Beacon Medical Group is currently located, according to Franciscan and Beacon Health officials. The project includes approximately 28,000 square feet of new construction and a 19,000 square foot renovation of the current space. When completed, the entire facility will include 92,500 square feet of space. 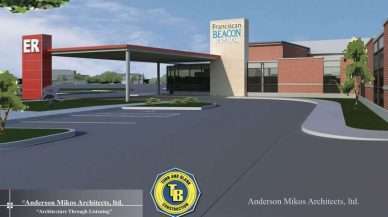 The new facility will be named Franciscan Beacon Hospital. It will include a full-service,10-bed emergency department, eight inpatient beds, laboratory services and telehealth connectivity, as well as state-of-the-art imaging and diagnostic equipment. In addition to the $21.6 million project, Franciscan Health physicians and specialists will join Beacon Health physicians on the campus. Currently both Beacon and Franciscan Health physicians serve a large number of patients from the area. “While this facility is a new model of care in the region, smaller footprint hospitals are opening all across the country,” said Kreg Gruber, Beacon’s chief executive officer. “These types of facilities, like Beacon Granger Hospital slated to open in the summer of 2019, are designed to meet the needs of patients when and where they need it. They provide a smaller, more patient-friendly model and higher patient satisfaction without sacrificing the highest in professional and expert care,” he added. The Franciscan Alliance healthcare ministry began in Lafayette, Ind., in 1875. Today, Franciscan Alliance is one of the largest Catholic health care systems in the Midwest with 14 hospital campuses, approximately 20,000 employees and a number of nationally recognized Centers of Health Care Excellence. Hospitals include: Franciscan Health Crown Point; Franciscan Health Michigan City; Franciscan Health Crawfordsville; Franciscan Health Lafayette East; Franciscan Health Lafayette Central; Franciscan Health Indianapolis; Franciscan Health Carmel; Franciscan Health Rensselaer; Franciscan Health Mooresville; Franciscan Health Chicago Heights, Ill.; Franciscan Health-Olympia Fields, Ill.; Franciscan Health Hammond; Franciscan Health Dyer; and Franciscan Health Munster. Beacon Health System is the largest, locally owned and operated non-profit health care system in the region. Beacon is our community’s trusted partner and guide in creating and maintaining health as well as the majority provider of services to the underinsured and underserved. Elkhart General Hospital, Community Hospital of Bremen, Memorial Hospital of South Bend, Epworth Hospital, Beacon Children’s Hospital, Beacon Medical Group and Beacon Health & Fitness are powered by more than 7,000 associates and 1,100 physicians who provide the best care possible to people of all ages. Beacon also trains medical residents in family medicine and hospital pharmacy.